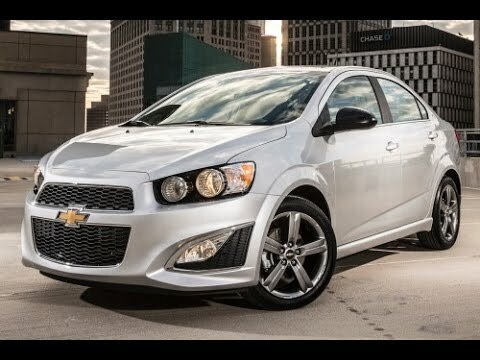 Chevy's Sonic subcompact for 2015 sets a new standard for small cars. A $15,000 starting price means it's easy to get into, and thanks to the Sonic's frugal gasoline consumption, refueling won't cost a week's salary. Best of all, unlike many subcompacts, the Sonic is fun to drive yet surprisingly comfortable on long trips. The hands free elements on the steering wheel is great. I like that my car is small, good on gas and has plenty of legroom in the back for my son who is only 14 and 6'2''. I do not like that it can only fit him and a car seat for a baby and a front passenger. I do not like that when going uphill with a fully loaded down car it has no power to climb. I like that i have a manual shift and i like that it has a ton of air bags (it is why i bought it for all the impact protection and gets good in town gas mileage) i love how it tells me my tire pressure is getting low and i love the onstar and bluetooth connection. I got the one without a back up cam, but my friend has the same car that has the backup camera. I do not think i like having the camera because it makes me feel lazy and not want to check my surroundings as much. Great city car, easy parking. This is a basic car with a minimum of bells and whistles. I like the gas mileage I get on the freeway, it is easy to park and drive, it is a bright red, drives smoothly, easy to get in and out of, is 5 star safety rated. There are some visibility problems, I removed both headrests from the back seats because I couldn't see out when in reverse. Also, there is a rather large blind spot in the driver's seat out of the front left window due to a thick black trim. I like the fact that it runs with the headlights on and then automatically turns them off when I park. I ran the battery down in other cars because I forgot to switch off the headlights. 2015 sonic the best Bluetooth car you can possibly get your hands on! I love my car my car has never given me problems in the past four years that I have had it. Just last week September 15 my battery went out which is fairly well knowing I have had my car for four years. I love the fact that my car is completely hands-free with Bluetooth I do not have to worry about picking up my phone because once it rings it rings directly to my car. I find my car to be a very safe, I do not even have to take my hands off the steering wheel to change the radio which I love very much because it is always safe to keep two hands on the steering wheel.